Herman was born with a cleft palate, cerebral palsy, and spina bifida to a farm family. His parents cared for him until the age of seven, but in 1020 they gave him over to the abbey of Reichenau Island in Lake Constance in southern Germany; where he spent the rest of his life. Aged 20, he became a Benedictine monk. Herman was a genius. 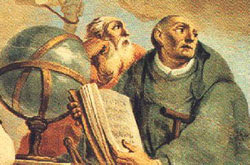 He studied and wrote on astronomy, theology, mathematics, history, poetry, Arabic, Greek, and Latin. He built musical instruments and astronomical equipment. In later life he became blind and had to give up his academic writing. The most famous religious poet of his day, he is the author of Salve Regina and Alma Redemptoris Mater.